Chaotic and with so many contradictions - this is Kampala, the capital of Uganda. The metropolis most sought after by the country's villagers who in the big city come to seek their fortune. “The average salary here is 20,000 or 30,000 shillings, 300,000 a year. About 1,000 US dollars,” explains Fr Elie Nyandwi, Director of the Salesian mission in Namugongo, about thirty kilometers from Kampala. Present since 2006 and for ten years supported by "Missioni Don Bosco" of Turin, here the Salesians manage the "Children And Life Mission" (CALM) center, which welcomes around 150 vulnerable children and adolescents every day. The center of Namugongo, with a primary school and a kindergarten, is home to mostly orphans and refugees, and children with difficult family situations. “Some want to become priests, other soldiers and others still businessmen,” continues the religious. The project of the Salesian elementary school in Namugongo started in 2015 and was supported by the Salesian Mission Office of Turin, "Missions Don Bosco". The same Office recently launched another charity project in Uganda, inside the Palabek refugee camp, where the Salesians arrived last year. The refugees welcomed there are, above all, South Sudanese Catholics who need pastoral, liturgical and spiritual assistance and are hungry for sacraments, mass and other pastoral and spiritual activities. Tomorrow night, in the Easter Vigil, 150 catechumens will be baptized in Palabek! In the last year and a half at least 12 prayer points have been organized, where Masses and other liturgical programs are celebrated: it is always officiated outdoors, but obviously this is not always possible and in any case it is problematic. For this reason the Salesians have decided to create 12 small chapels, between solid and lasting ones and semi-permanent ones. And through prayer and other ecclesial activities, they can spread peace and fraternity. Years and years of work and patient waiting have elapsed, and it has now been a few days since the "San Benedetto Abate" parish of the Salesians of Ferrara has returned to its former glory. The celebration began in the early afternoon with the reception in the oratory; then, at the arrival of the city bishop, Msgr. Giancarlo Perego, they entered the church that is finally ready, and the Eucharist was celebrated. Finally, the day of celebration was completed with a moment of fraternal agape in the oratory. “After almost seven years we are finally back home. Because this is what we are talking about: a House where we can meet, and meet Him, as a community,” commented Elena Mastellari, Ferrara's animator and member of the National Council of the Salesian Youth Movement (SYM), satisfied. The Salesian oratory of Ferrara has endeavored to continue functioning as it always has these past seven years and, not without difficulty, has managed to cope with the damage caused by the earthquake. So those spaces that remained available were used for different purposes. The young woman adds, “It wasn't easy to get used to the idea of having to go to Mass in the same place where you'd return in the afternoon with a bag of popcorn in your hands to watch a movie,” she said, referring to the house's theater. Now the work has paid off: “It was incredible to see the wide open eyes of those children who entered the church for the first time on Saturday night,” continues Elena. In these seven years the parish and Oratorian community has not only maintained itself, but in a certain sense it has been strengthened precisely to face difficulties. “At every call from our priests there was always someone, young and adult, ready to answer 'I am here',” the Salesian animator concludes. 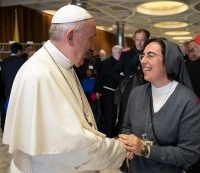 "Her mandate, which is carried out collegially together with other councilors, reunited in the Pontifical Commission for the State of the Vatican City, is five years," explains a note from Auxilium, where Sister Smerilli teaches. "The State Councilor provides assistance in the elaboration of the Vatican Laws and in other matters of particular importance." The Pontifical Commission for the Vatican City State, composed of a General Councilor and five State Councilors, is the body that exercises legislative power in the Vatican City State. It is the dicastery that holds the de facto administration of the Vatican City State, overseeing most public functions and representing the state on behalf of the Pope. Prof. Alessandra Smerilli was born in Vasto in 1974, and graduated in Economics from the University of Roma Tre. She then specialized in Political Economics at the Sapienza University of Rome and at the School of Economics of the East Anglia University in Norwich. In addition to teaching in the "Auxilium" Faculty, she holds teaching positions in other university institutions, is a member of the Scientific and Organizing Committee of the Catholic Social Weeks, promoted by the Italian Episcopal Conference, and is one of the experts of the National Council of the Third Sector, a body established at the Ministry of Labor and Social Policies. Last October, Sister Smerilli participated, as an auditor, in the Synod of Bishops on "Young people, faith and vocational discernment" - that same Synod in which the voice of the young required, among other things, greater consideration of women in positions of responsibility within the Church. Now for Sister Smerilli there is this call on the part of the Pope, to take on a task of responsibility in which she will bring her experience on the subject of economics. The rice-meals donations were distributed to programs in Cambodia connected to Don Bosco Technical & Hotel School Sihanoukville, Don Bosco Technical School Phnom Penh and Don Bosco Technical School Kep. Beneficiaries included 1,100 vocational and technical students at the schools who are studying to gain the skills needed for long-term employment. The Salesian schools provide technical skills training for young people from poor families and also offer boarding opportunities for those who find it difficult to rent a room on their own. One of the rice-meals donation recipients, Sokkhin Chea, is a 20-year old student from Don Bosco Technical School Phnom Penh and is in her second-year studying computers. She has eight siblings and her father died when she was in the 12th grade. After finishing high school, Chea applied to Don Bosco Tech and requested to stay at its boarding house since she could not afford to live on her own or pay for her own meals. Before she came to Don Bosco Tech, Chea was working hard in the fields with her mother, brothers and sisters in order to have enough money for food and to be able to go to school. The feeding program and rice-meal donation are ensuring that Chea and students like her have the nutrition they need to focus on their studies. The Don Bosco schools are providing technical education for poor youth in subjects including electrical, mechanical, welding, automotive, electronics, computer and information technology, printing, media communication, hospitality and tourism. After students graduate, they are qualified for jobs that offer a decent salary, allowing them to support themselves and their families and break the cycle of poverty. According to the World Bank, poverty continues to fall in Cambodia. In 2017, the poverty rate was close to 14 percent compared to 47.8 percent in 2007. About 90 percent of the poor live in the countryside. While Cambodia has achieved the Millennium Development Goal (MDG) of halving poverty in 2009, the vast majority of families who escaped poverty were only able to do so by a small margin. Around 4.5 million people remain near-poor, vulnerable to falling back into poverty when exposed to economic and other external challenges. When he was assigned to Iauaretê, he admits, it took a long time to find traces of the mission on the map of Brazil. Today, however, after more than four years of service, he holds various positions: he is Director of the mission, parochial vicar and responsible for the activities of the oratory. He also visits the 50 villages belonging to the parish, scattered along 4 rivers, in an area the size of Veneto. "The distances (one arrives there only after 2.5 days along the river) the Spartan style of life, and diseases such as malaria, represent the small price to pay for having the honor of living among these peoples, 16 different indigenous ethnic groups, among these simple people, always having a greater attention for the little ones and for the adolescents," says the missionary. The big problem of that area is alcoholism, which is increasingly expanding, due to the clandestine entry of industrial alcohol, which is not even supposed to enter the indigenous reserve. And with alcohol comes the Colombian drug traffickers, the violence in families, among the young and in the villages ... All problems that go to impact the youngest, first of all. For this reason, little by little, the Salesians are building a new home: it will take time, because the materials can only be transported by river and the work is done manually, but by 2020 it should be ready. Then, in addition to the Salesian community and aspirants, it will be able to accommodate children who are abandoned for days in the narrow streets of Iauaretê on weekends and in festive moments, "without a shelter, without food and with the fear of returning to their hut and take the beating from one of the adults; and when they are not beaten, they are even worse violence," testifies Fr Cappelletti. The Salesian Family - the Daughters of Mary Help of Christians are also present in the area - is there precisely for them, "so that children can grow with another vision of life, with other prospects, with the certainty that Jesus loves them," concludes Fr Cappelletti . (ANS - Madrid) - Among the thousands of pilgrims who come to the Cathedral of Santiago de Compostela every year, it is increasingly common to see groups of students accompanied by their teachers. Several Salesian centers offer this experience to their students throughout the year and some in the very days preceding Holy Week. This is the case of the “San Miguel Arcángel-Salesianos Paseo de Extremadura” centers in Madrid; "Salesianos Loyola" in Aranjuez; "Salesianos Atocha", in Madrid; "Salesianos Hermano Gárate", in Ciudad Real, and "Salesianos La Orotava", in Santa Cruz de Tenerife. This period "is preferred because it is academically more favorable," explains Susana de Torres, a teacher at the "San Miguel Arcángel" school. And the Lenten climate also has a positive influence: "It is an excellent time to prepare for Easter; in fact, many times we have made our arrival in Santiago coincide with Palm Sunday, to then reflect together on the analogy of festive entries in the city, for Jesus, and for the students," explains prof. of Ciudad Real, Enrique Ruiz. 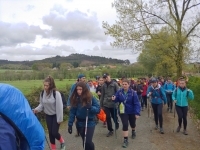 The "San Miguel Arcángel" school organizes the participation of its students in the Camino de Santiago to "take care of the intermediate courses pastorally," adds Professor de Torres. From its beginning, which is becoming a beautiful tradition, the Salesian centers have transmitted to the students the central motivation of this activity: "it is a pilgrimage, not a cultural or sporting journey." On the journey, faith is the guiding thread, with those proposals that are already made daily in educational centers, but which take on a special role during the days of pilgrimage. On some occasions, symbols are also used, perhaps between the yellow arrows that indicate the path of the Way and "those people that God puts on our path as guides," adds the teacher. "We try to ensure that the pilgrimage encourages an encounter with oneself, with others and with God," adds another professor, Celia Antolín, from the center of Loyola-Aranjuez. The long hours on foot favor solidarity and in-depth reflections. "All the difficulties are faced in a great family spirit ... The big questions you ask are all about yourself," says prof. Ruiz. Experience shows that along the way the kids go into relationships with family, friends, God ... "The hours of walking give us the opportunity to talk about many of these topics, and in a much more natural way than can be done at school," concludes Prof. Antolín. And, as rightly emphasized by prof. Ruiz, "the teacher is just one more pilgrim." Four Salesians are assigned to this new pilot project (two Salesian Brothers and two Salesian Priests), who are still members of the large Ben Cat Community (Rector Fr Peter Hoang), but fully involved in Majcen Training Centre. The new Don Bosco Bakery - Cafe offers to the young people in Vietnam not only the opportunity to learn bread and sweet-making skills but also to learn about management and marketing, marking a new step toward the self-sustainability of our Vocation Training Center. From the idea stage the whole project has been accompanied by many Vietnamese and foreign experts, also the presence of two volunteer staff - a chef and training staff enhance the quality of training. Also this new outreach is a fruit of the cooperation among Salesians and expatriate volunteers helping the Majcen Bistro - Training Center. The Grand Opening was celebrated on Sunday, April 14, with a blessing and simple cultural items to make the new Bakery - Cafe known in the neighbourhood. “We wish and pray that the new Don Bosco enterprise will help many young people in Vietnam with their integral preparation for life and also that the Salesians will learn how to grow in the self-sustainability of our vocation training institutions,” the Salesians say. Imitating Don Bosco, the “Anre Mai Sen Hospitality Training Center” – named after the Slovenian Salesian Father and Servant of God, Andrej Majcen, well-known as “the Don Bosco of Vietnam” – provides for poor youth the opportunity of on-site training for Restaurant, Kitchen and Bakery careers. Improving on the Dual System Training from Germany, after 3 years of theoretical and practical training as well as an internship, the Salesian Training Centre is able to offer to the trainees a Culinary Certificate from Germany. (ANS - Rome) - On the occasion of the 150th anniversary of the foundation of the Association of Mary Help of Christians (ADMA), Fr Ángel Fernández Artime, Rector Major, sent his greetings and a message to ADMA members and to all the members of the Salesian Family, highlighting the value of the Eucharist and entrustment to the Help of Christians in Salesian spirituality. Significantly, the Rector Major sends this message from the Basilica of the Sacro Cuore of Rome, before the altar of the Help of Christians, recalling how it was here that Don Bosco received confirmation of his mission carried out under the guidance and protection of Mary. Finally, he announced the publication of a letter on the occasion of this anniversary and spoke of the celebration of the VIII International Congress of Mary Help of Christians, to be held in Buenos Aires, Argentina, from 17 to 10 November this year. My dear brothers and sisters of the Salesian Family throughout the world, receive my affectionate greeting on this Palm Sunday. I greet you today because on Holy Thursday, in four days, the 150th anniversary of the foundation of what we now call the "Association of Mary Help of Christians" will be celebrated which at the time was the Archconfraternity of Mary Help of Christians. In the foundation document, one reads a text by our beloved Father Don Bosco. "In the church dedicated to Mary Help of Christians in Turin and with the authorization of the Reverend Archbishop of Turin, the Association of devotees who intend to promote the glory of the divine Mother of the Savior is canonically constituted, to merit your protection, in life and in particular at the moment of death. There are two means offered as special means: extend the devotion to the Blessed Virgin and the veneration to Jesus in the Blessed Sacrament". We read it in the document of Catholic readings that communicate this message, because it is an occasion to say that what we are celebrating is something beautiful. Although what I have just read to you is the beginning of the letter that I am going to render public for the whole Salesian Family, today I just want you to get a greeting from the altar of this site, the altar of Mary Help of Christians in the Basilica of the Sacred Heart. The altar that I like to call "Don Bosco's tears and sobs", because in this place Don Bosco had that manifestation of what his life was, entirely accompanied, without doubt, by the Lord who has always guided him with the unique and special protection of the Mother. Because "She did everything", as Don Bosco used to say. My words of today are congratulations for these 150 important years for the whole Salesian world, for our Salesian Family, for the 800 legally constituted groups of our "ADMA" Association. And it is an invitation to fulfill what Don Bosco proposed: extend devotion to our Mother Mary Help of Christians, with the certainty that with the Eucharist and with Her, our Mother, we have these two great pillars that personally support our life, the Salesian Family and the Church. I take this opportunity to remind the whole Salesian Family that, under the guidance of the association of Mary Help of Christians, we shall celebrate at the end of the year, in the last part, the World Marian Congress in Buenos Aires, Argentina, where Mary will be proposed as a model of faith for all of you, dear brothers and sisters. My affectionate greeting, my words of encouragement and my prayer before our Mother Help of Christians, for all of you, for our Congregations, Institutes, Families and Communities. The video message of the Rector Major is available online on ANSChannel. Hazel, from our Chaplaincy team, in the beginning of the school year, gathered quite a few volunteers to take part in “Faith in Action”, a well-known annual Catholic Youth Programme. Each Wednesday the whole group meets in the “Bosco Room” for a reflection on the life of another Saint which is being delivered by a Salesian. Every week the Bosco Group goes over one saint with a fine-tooth comb. After a few minutes of introduction, two or three stories, a short film, and then a 3…2…1…discussion, participants try to find out how to interpret these interesting stories into their own life practice and answer some questions. What is extra-ordinary in this particular Saint? Was he a strange creature from a fairy-tale or a normal human being with a good dose of grace? And the most important one: how to follow his/her example? Their answers and ideas are really inspiring. Everything was started by a reflection on holiness based on the Apostolic Exhortation “Gaudete et Exsultate” of Pope Francis and this year’s message from Fr Ángel Fernández Artime, the Salesian Rector Major. They both shout at the top of their voices that sanctity is possible for everybody. The Savio Salesian College students were astonished at discovering that holiness isn’t to be perfect, but to realise God’s dream for their life. Even if it seems to be so far from reality, it is still possible. Holiness is for you too! (ANS - Freetown) - Musu was a child when the Salesian missionary Fr Jorge Crisafulli found her on the street under a table in the center of Freetown. It was raining heavily and it was cold for those used to tropical heat. "What's your name?" he asked her. "Are you sick?" Her sad eyes and the pain in her face announced deeper pains than just physical ones. She coughed unceasingly. Fr Crisafulli put his hand on her forehead and noticed that it was burning with fever. That was the beginning of a great story of hope. Little Musu told him that she had gone to the hospital, but not having 15,000 leones (about 1.5 euros) to enter, she had not been treated. "I will take you to the hospital immediately," said the Salesian; but at that moment Musu turned to look for something beside her and put a helpless, skeletal, almost dying, nameless baby boy in the hands of the cleric. Fr Crisafulli accompanied Musu to the General Hospital, where she was diagnosed with tuberculosis and pneumonia. As for the child, since they did not have the means to treat him there, he took him to the "Cottage Hospital", where he was found with tuberculosis, dehydration and malnutrition. When the doctor asked for a name to register the child in the health center, the Salesian missionary did not hesitate for a moment: "His name is Juan Bosco, Juanito Bosco". Musu changed her expression and seemed annoyed. The Salesian asked her if she did not like the name Juan Bosco and she replied, "you should have given him your name: Jorge Crisafulli!" (ANS - Turin) - From the charismatic riches of the Association of Mary Help of Christians (ADMA) - which is preparing to celebrate the 150 years of its foundation the day after tomorrow, Holy Thursday – comes the proposal of a special itinerary for young people who intend living with Mary Help of Christians the experience of faith: this is ADMA Youth. The ADMA Youth groups participate fully in the spirit and life of the association and cooperate with ADMA and the Salesian and diocesan Youth Ministry. The experience of the ADMA Youth groups arose almost spontaneously in different realities of the world (from Turin-Valdocco, to Venezuela, Bolivia ...). The youth groups of the ADMA are characterized by the reference to the "two columns" of Don Bosco's dream: the Eucharist and Mary Immaculate and Help of Christians; the relationship between Youth and Family Pastoral; the daily entrustment to Mary; the promotion of formation paths oriented to live and witness to youthful holiness; commitment to service and animation; the Gospel of charity lived in service to the little ones and the needy. But what could the specific mission of the ADMA Youth ever be, born within the path of the ADMA Families? The answer is simple: education of the heart. Never as today do young people need to learn to love, love themselves like others and God, above all else. A unique experience, in this sense, was the series of meetings entitled "I LOVE YOU", promoted by the ADMA Don Bosco group in Turin and intended for secondary school students. The course, centered on the themes of affectivity and sexuality, was led by Salesian Fr Roberto Carelli, but the issues for reflection were concretized and enriched by numerous testimonies of married couples, engaged couples and young people who led the workshops and curated group moments. After a first meeting on the beauty and delicacy of human sexuality and affectivity, the second meeting deepened the many meanings of the difference between men and women, while the third and fourth meetings were devoted respectively to the stages of affective maturation and to the moral orientations on specific themes of the sexual sphere: a Christian word on all the main "hot spots" of human love. The large participation of more than a hundred members confirmed the urgency of this type of formation and the need for discussion on issues on which the happiness and success of children's lives depends. (ANS – Gabutu) – “Two elements from my childhood urged me towards becoming a missionary. One was my dad. Before he got married, he worked four years as a builder-foreman in Ghana, Africa. His stories and pictures fascinated me very much. Second, as a young adult I had an accident in the sea. I was caught in a current and almost drowned. Only through God’s grace was I saved. I received a second life. I saw it as a call from God for some specific mission for me. This was also the time I was woken up from an over-protected life in my family and left without any clear direction in life.” Speaking is Reto Wanner, Salesian missionary from Switzerland into Papua New Guinea. “Not long after the accident I came to know that the Salesians in Papua New Guinea needed an instructor in mechanics. I had the required background of mechanical engineering. I offered my services through a Swiss volunteer organization. I stayed three years in the Don Bosco Technological Institute at Port Moresby, the capital of Papua New Guinea. Very soon I came to realize that sharing only my engineering knowledge and professional skills was not enough. The accompaniment of the young people became more and more important to me. My role models were many Salesians, Daughters of Mary Help of Christians (FMA) and the aspirants among whom I worked. I returned to Switzerland and began to work as a project leader in a metal fabrication company. I felt unsatisfied. I missed the young people. I was no longer interested in making a career, looking only for my own benefit and wellbeing. I turned once again to the Salesians. In spite of not being a Catholic, I was allowed to start my aspirantate. I became a Catholic. Already in the novitiate I felt the vocation to become a lay brother – to be with the young people in the workshop, class room, dormitories. The good Lord guided me further towards this. The missionary experience I had had accompanied me all through my formation. After making my final vows Fr. Provincial, Josef Grünner, allowed me to return temporarily to PNG. There my wish to become a missionary intensified so much that, in 2016, I followed the call of the Rector Major to be a missionary ad vitam. And again, the good Lord let me go back to PNG. I am assigned for five years to Don Bosco Technological Institute – the same institute where I had been as a volunteer. My main task is technical education in the machine fitting and welding trade. A good change from this demanding work as an educator-pastor is the Sunday oratory. Sharing my life with the less privileged children and youths from our neighbouring villages gives me great fulfilment and strengthens my identity as a missionary. I am very happy to be a Salesian lay Brother. I am fully immersed among young people – in the classroom, in the workshop and in the Oratory. After class I spend time with the students and children. Through this intense togetherness a relationship of trust and love has emerged. The young people’s confidence in me has grown. They open up. They get interested in my life as a religious. So, I get opportunities to share with them my Christian values and promote good behaviour, respect, dignity, love, etc. A holistic formation is taking place, which will last far beyond our time together. Looking back, I think what is most essential for a missionary is to be open and humble. Had I not listened to God and let myself be guided by the Holy Spirit, I would not have become a Salesian, a brother, a missionary”. (ANS - Rome) - "The undersigned humbly exposes to your Most Reverend Excellency that for the sole desire of promoting the glory of God and the good of souls a pious union of the faithful should be started under the name of Association of the Mary Help of Christians in the Church of Mary Help of Christians which thou consecrated a year ago; its main purpose would be to promote veneration of the Blessed Sacrament and devotion to Mary Auxilium Christianorum: a title that seems to return with vivid pleasure to the august Queen of Heaven." It was with these words that Don Bosco asked the archbishop of Turin, Msgr. Alessandro Ottaviani Riccardi, for the authorization to establish the Association of Mary Help of Christians (ADMA), with the aim of promoting the faith of the Christian people. On 18 April 1869, the archbishop decreed the canonical erection of the Association, which marked the beginning of the second group founded by Don Bosco. In the same year, in order to expand the association, Don Bosco wrote a booklet "Association of devotees of Mary Help of Christians canonically erected in the Church dedicated to her in Turin", in response to the numerous requests to establish an association of the faithful "who joined in the same spirit of prayer and piety to pay homage to the great Mother of the Savior invoked with the beautiful title of Help of Christians." Membership to ADMA commits to participating in Don Bosco's mission above all by spreading Marian popular devotion as an instrument of evangelization and promotion among the working class classes and youth most in need. It is significant that the foundation's 150th anniversary coincides with Holy Thursday, underlining how the Eucharistic cult is, with the devotion to the Immaculate Conception, the founding point for the spirituality and life of the Association. The 150th anniversary of ADMA's foundation will be particularly remembered in the Basilica of Mary Help of Christians in Turin, during the Eucharistic adoration of Holy Thursday, as well as in the 800 local groups across the globe. Confirmed with the celebration of the 150th anniversary is the wish formulated by Don Bosco himself in 1869: "The holy Virgin Mary, who in so many ways [different ways] has blessed and favored those who have begged her with the precious title of Help of Christians, continue to spread the heavenly treasures copiously, not only over the aggregates to this pious Association, but above all those who will invoke it in their spiritual or temporal needs, as a sign that all have reasons to bless it above the earth, to then go and praise her one day and thank her eternally in heaven." (ANS - Cartago) - An ecclesial movement of married couples and family apostolate, with a strong Salesian spirituality, is taking hold in Central America, as an option of hope to save and strengthen families. What was born simply as a possibility of accompaniment and formation for the parents of the young people who attended the “Santo Domingo Savio” Salesian center in Cartago, Costa Rica, has instead become the gateway through which the “Hogares Don Bosco Movement”(HDB) is expanding today in the Central American region. In 2015, the married couple Alejandro Loría and Priscilla Bogarín, two Costa Rican Salesian Cooperators, was called to the Salesian Center "Santo Domingo Savio" of Cartago to start the Family Pastoral. 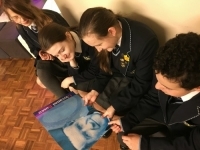 After an arduous research on the different options present in the Salesian Family, they learned about the experience of the "Hogares Don Bosco" (Don Bosco Houses) born in Spain, and found therein a movement that brought together all the features they had been seeking in a Family Pastoral in Salesian spirituality. In fact, HDBs offer a concrete option for all those who have experienced a Salesian spirituality and wish to maintain it within the vocation to marriage to which they have been called. "When we accepted the adventure of forming a group of 'Hogares Don Bosco' in Costa Rica, we thought only of offering a space of growth for the families of the young people who attend the Salesian center, in order to support the work that the groups do with children, but in the HDB we have found an answer to our concerns of growth as spouses, as parents, as adult co-workers of the Kingdom of God, called to a daily life of holiness," said Priscila. And this is how they immediately contacted the National HDB Commission of Spain, in the persons of the married couple Cristóbal Marín and Irene Blaya. The HDB Movement was born in 1965 in Spain, thanks to several Salesian Cooperators. Today the HDBs welcome all those couples who, by freely accepting the underlying ideal and respecting its norms and guidelines, want to undertake a serious journey of human and Christian growth. In Central America, from the foundation of the first group in Cartago, in October 2017, until today, the current members have traveled a challenging path and have had the full support of many members of the Salesian Family, including Fr Ángel Prado, Salesian Provincial of Central America (CAM), and Fr Javier Rivas, his Vicar. Their experience was also shared by the Delegate of the Rector Major for the Salesian Family, Fr Eusebio Muñoz, SDB, during the recent IV Central American Meeting of the Salesian Family: "We invite you to recognize the richness that exists in 'Hogares Don Bosco'. We wish to reach as many families as we can and place them under the protection of our Mother Help of Christians." he said on that occasion. Colombia - "Young people want to be understood, educated and accompanied": Fr Jaime García receives first "Civil Order of Merit Javier de Nicoló"
(ANS - Bogotá) - “Young people want to be understood, educated and accompanied in their process of cultural, work and professional growth. This is what we offer to those historically ignored: the poorest in Bogotá.” Thus stated Fr Jaime García, SDB, in receiving the first "Civil Order of Merit Javier de Nicoló" awarded by the Bogotá Municipal Council. Fr Javier (Saverio) de Nicoló, a Salesian priest and missionary, founder of the District Institute for the Protection of Childhood and Youth (IDIPRON), remembered throughout the city and the country for his work with disadvantaged children and young people, would have said the same thing. "Together we finished the baccalaureate and ventured into priestly formation. Javier was a star of God for the smallest of Colombia," said Fr García during the ceremony in which he received the medal bearing the name of his friend and confrere. This new Civil Order of Merit is the result of a decision by the Bogotá Municipal Council to honor the memory of a priest who has worked for over 40 years for the rights and well-being of children and young people, and designed to give recognition to those who dedicate themselves to this same sector. Thus to the first awarding of the recognition - carried out on the occasion of the third anniversary of the death of Fr de Nicolò - among the honored is Fr Jaime García, thanks to his work at the “Juan Bosco”, where over 8,000 students have grown, thanks to non-formal education, art schools and sport. 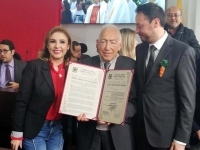 The motivation reads: "At the age of 88, Fr Jaime Garcia Cuéllar continues to work in favor of the whole youth community in a situation of high vulnerability, and continues to change the lives of thousands of young people with scarce resources." The award assigned to Fr García also encouraged the memory of Fr de Nicoló, who in his life helped about 80,000 young people throughout the country in social reintegration processes and who, although he died in 2016, is still alive in the memory of many. Today the footsteps of this great Salesian are retraced by other spiritual Sons of Don Bosco and by co-responsible laity in the mission. "Now we want to continue working under the care of his heir, Fr Jaime García," said Alexis Vidal, of the project "Circus Juan Bosco Obrero", a group of young people born in the Salesian center of Fr García, which educates young people to circus arts. (ANS – Fianarantsoa) – Salesian missionaries in the Fianarantsoa region of Madagascar are able to assist 10 graduates of the local Salesian vocational training center in launching a small business enterprise, thanks to Salesian Missions donors. The project will train the Salesian graduates in management, operations and the development of a plan to establish a construction business. In order to help youth break the cycle of poverty and hopelessness, Salesian missionaries in Madagascar operate elementary, middle and high schools throughout the country. The focus of the schools is on providing educational opportunities, increasing literacy and laying a foundation for education well past the compulsory education required in the country. Access to education and training in social and life skills encourages graduates to find liveable wage employment, breaking the cycle of poverty. 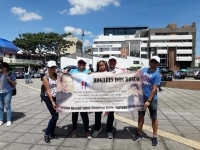 Brazil - "Radio Dom": two years on the air, now broadcasts stories told by Don Bosco in his "Memories of the Oratory"
(ANS - Curitiba) - "Radio Don Bosco" is an online radio station of the Salesians, established in 2017 in Curitiba, with a Salesian identity, and where young people produce the content. The Salesians also collaborate in radio programming and in the first two months of broadcasting 15 programs were launched and a loyal audience of 10,000 listeners was reached. Today this radio is gradually expanding its audience, launches new programs and has been renamed itself "Radio Dom." "Radio Don Bosco" was rebaptized "Radio Dom" on August 16, 2018, the 203rd anniversary of the birth of Saint John Bosco. Being a Salesian radio, the name "Dom" obviously refers to Don Bosco, (Dom Bosco, in Brazil); but it can also recall the idea of gift, at the service of others. "Radio Dom" is an integral part of the Salesian Communication Network of Brazil and is maintained in association with Vatican Radio and other broadcasters. Today it has 20 programs and an audience of over 150,000 listeners, has its headquarters in Lorraine, and other centers in Curitiba, Sao Paulo and Piracicaba. On the occasion of the two years since its debut, a new program has been launched: it is called "Memories of the Oratory." Through the voice of Fr Maurício Miranda, it tells the story of the Salesian Congregation and Don Bosco's autobiography narrated in the book “Memories of the Oratory of St Frances of Sales.” The program lasts ten minutes and is broadcast three times a day. Another gift from the broadcaster to its radio listeners is the availability of programs through podcasts, which allow them to listen to their favorite programs at any time. The first two podcasts are related to the program "Memories of the Oratory" and "Walking with Mary", presented by Fr Hilário Moser. To listen live, learn more about programming, send messages or download the podcasts, you can visit www.radiodom.com.br or download the "Radio Dom" application, available for Android phones. The radio is also on Facebook and Instagram. "Radio Dom" is a true gift for those who want to hear a voice at the service of youth and evangelization. (ANS - Santiago) - One hundred people belonging to the educational community of the Silva Henríquez Catholic University (UCSH) gathered to commemorate the twentieth anniversary of the death of Salesian cardinal Silva Henríquez, with a Eucharist celebrated in the temple of Mary Help of Christians of Lo Cañas, in Santiago, on the morning of Tuesday 9 April. The Eucharist was presided over by the President of the "Cardinal Raúl Silva Henríquez" foundation, Msgr. Camilo Vial, and concelebrated by the Provincial of the Salesians in Chile, Fr Carlo Lira, and by the Rector of the UCSH, Fr Galvarino Jofré. During the homily, Fr Lira spoke about the figure of the good shepherd and how Cardinal Silva Henríquez knew the Salesian charism and Don Bosco. "Because if there is one thing that Cardinal Raúl has taught us is that between word and action there must be no difference: we are called to collect this heritage to serve man in all his dimensions, and above all those who live in urgent need. The young are the raison d'être of this institution, and have occupied a priority place in the life of Fr Raúl, as a person, as a Salesian and as a pastor." 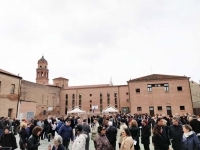 Taking place after the Eucharist was the inauguration ceremony of the campus of Lo Cañas, work jointly completed by the Salesian Province and by the UCSH. The campus now has new classrooms, laboratories and equipment and in 2019 it welcomes 300 new students in phono-audiology, kinesiology and nursing courses. During the ceremony, Fr Lira addressed the audience, saying: "This shows that the university is not a mere appendage to the Congregation, because it is its university, and we are planning the Salesian mission strongly in this university field." He then added: "We have proposed ourselves to challenge this institution to achieve the objectives that a Salesian university in Chile should have: to be a reference point for youth in pedagogical thought, and in human development." For his part, Fr Jofré said: "A dream becomes reality, placing at the service of the new generations of students a privileged space, which for years has served for the philosophical and theological formation of the Salesians. The Province demonstrates its commitment to the UCSH by offering it one of its best spaces." The celebration ended with the blessing of the structures, the cutting of the ribbon and the opening of the doors by the students present.